What is the Best Way to Get from Shenzhen to Hong Kong Airport? It's either you're crossing to Hong Kong from Shenzhen through Lok Ma Chau or Lo Wu border, you need to take the MTR trains towards East Tsim Sha Tsui and get off at the very first station - Sheung Shui MTR station. Take Exit D towards Sheung Shui's big shopping mall - Landmark North to your left ground level, DO NOT cross the street. It's only about 10 to 15 meters away to the SHEUNG SHUI BUS TERMINUS. Take the Airport Express Bus KMB No. A43, HK$30.9 about 41 minutes ride to AIRPORT (GROUND TRANSPORTATION CENTRE) BUS TERMINUS (second Bus Stop from Sheung Shui). Here's the Sheung Shui MTR station location map and and A43 bus stop to HK airport. Comments for What is the Best Way to Get from Shenzhen to Hong Kong Airport? Buses leave from Garden Hotel in Guangzhou to the Airport. In total this will take about 3-4hrs if you don't experience traffic jams. Therefore it's faster to take the train from Guangzhou (East) to Luohu. Than MTR, Bus and/or taxi to HK airport. The ferry from Guangzhou only goes once a day and is far out of Guangzhou city. Re: Thx to Kinsider Don. 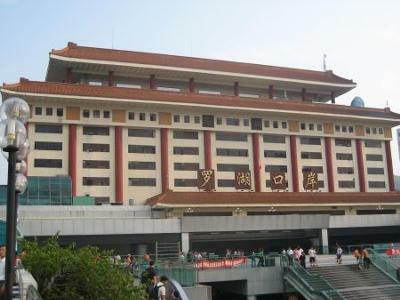 You need to get back to Shenzhen from Guangzhou, cross the border at Louhu/Lo Wu and take trains to Sheung Shui station then a bus from Sheung Shui station to HK Airport. Or, take trains at Lo Wu station all the way to HK Airport (please refer to posts above). The last trip for bus A43 from HK Airport is 12am. For overnight bus N42A, only 1 departure from HK Airport at 12:20am. For instruction and fare details, please refer to the above post dated december 10, 2008. Take a cab to Lo Wu from Sheung Shui station if train service is no longer available by the time you get there. Taxi from Sheung Shui station to Lo Wu, 9 minutes at HK$38.25. Taxi fare from HK Airport to Lo Wu is HK$375.75. Travel time is 48 minutes. Thank you Don Kinsider. Much appreciated. If I take the bus from HKIA to the area of Luo Wu, (Century Plaza hotel) is it then not possible on my return from Guangzhou, to travel to Shenzhen by train, get off at Luo Wu and get a ticket from the hotel to return to HKIA by bus again???? Century Plaza hotel is only about 5 minutes walk from the station. I arrive at HKIA at 11pm, too late to use public transportation. I suppose Taxi is the only way. Do I take it to Lo Wu and then another Taxi once I cross the border? How much should I expect to pay? Guangzhou has a direct Ferry route to HK Airport Skypier but the Ferry route services are only intended for transit (sea-air) passengers. I will arrive in Hong Kong on Feb 26 at 2pm and would like to travel to Shenzhen (Lo Wu) and believe that there is a direct bus from HKIA to this area of Shenzhen. Can someone please tell me which bus I need to take. I also want to travel from Guangzhou either by train or bus directly to HKIA on March 5th. I hope that someone can also assist me with this. Re: Private van or car transfers to Shenzhen from Hong Kong? Please refer to the above posts. These are the only options we can give you for now. If you'd be staying in a hotel in Hong Kong, you may arrange with the hotel your requested return service. And if I may add, trains to Lo Wu have first class compartments for your convenience. Also, you may consider taking a cab straight to Lo Wu that would cost you around HK$288 at 44 minutes if you'd be coming from Tsim Sha Tsui area. Private van or car transfers to Shenzhen from Hong Kong? I am traveling between Hong Kong and Shenzhen return with small children and prefer not to have to cart luggage between trains and buses. Are there reliable, reputable car or van transport companies that operate from Hong Kong that can give me a return service? What is the approximate cost of this service? YES, there are very comfortable coach services with a direct routes to major destinations in mainland China that are available at the Coach Station of Terminal 2 at HKIA. Regular services depart from HK airport to destinations like Shenzhen (with a bus stop at Shenzhen Shangri-La Hotel in Lo Wu), Huanggang, Shenzhen Bay Port, Guangzhou, Dongguan, Huizhou, Foshan, Zhongshan, Fujian and Xiamen. * Shuttle Bus travel time: from HK airport to Shenzhen Shangri-La Hotel in Lo Wu is about 1.5 hours. * Shuttle Bus Service hours : 7:00am to 10:00pm and departs every hour. Hope this help and have a safe trip! Where does one get the shuttle which leaves from HK International airport to Lo WU? Last time I was there, I managed to get a shuttle from Shenzhen all the way to the airport for RMB 200 and would now like to visit Shenzhen again and would like to take the shuttle from the airport to Lo Wu Shenzhen. Re: From Shenzhen to Hong Kong Airport. Actually if we try to examine which way is more efficient, by MTR or by Ferry to travel from Shenzhen to HKIA, I would say it is a case to case basis depends on which part of Shenzhen is your location. If you're coming from Louhu or Lu Wo and the nearby area for shopping then the taking the MTR trains at Lu Wo station right after you check our from HK immigration would be the best way. Actually the train route would be MTR trains (from Lo Wu station to Tsing Yi station) plus Airport Express trains (from Tsing Yi station to Airport station). Train travel time is about 80 minutes @ HK$60 (using octopus card). But if you're coming from any other place in Shenzhen specially if it has a Ferry route to Hong Kong International airport then we recommend you to take the Ferry. Aside from Macau, the places in Shenzhen, China or nearby provinces that has a direct Ferry route to HKIA Skypier are the following; Fuyong, Shenzhen; Shekou, Shenzhen; Humen, Dongguan; Nansha, Guangzhou; and Jiuzhou, Zhuhai. Important reminder: The above Ferry route services are only intended for transit (sea-air) passengers so that they can avoid the hassles of going through immigration procedures at the airport while their baggages are delivered straight to their destination. Here's the map showing the marker for the exact location of HKIA Skypier. Hi all, I have read the tips and comments about "What is the Best Way to Get from Shenzhen to Hong Kong Airport?" and feel that the train route is really troublesome, especially if you travel with kids. Changing so many trains are not fun. Would you agree that the best way to get from Shenzhen to HKIA is by ferry instead of MTR? My google research shows that the route from HKIA to Shenzhen Shekou is only 30-40 minutes and no need to change so many transportation. But I need more detail info, how to get to HKIA's SkyPier? where is its location? Add up all the costs of cabs, buses, and trains in most options and you're talking over 150 HKD. I take the Skylimo van from the HKG airport to the doorstep of my hotel in Shenzhen for 220RMB. Don't have to wait on customs or carry your luggage from place to place. The convenience is worth the extra money. Yes, you're correct that taking Bus A43 and change to MTR East Rail trains at Sheung Shui station towards Lo Wu station is more fast compared to taking MTR all the way to Lo Wu station. We've tried that route and we find it not only efficient but also cheap. Good luck and enjoy your HK trip. I would believe taking Bus A43 and change to MTR East Rail trains towards Lo Wu station would be a faster route compared to taking MTR all the way to Lo Wu station. Am I correct? Here's the most efficient way to travel from Hong Kong airport (HKIA) to Lo Wu/Shenzhen border. Take the Airport Express trains from (HKIA) airport to Tsing Yi MTR station - (HK$60, about 15 minutes trip). From Tsing Yi station, Take the MTR Tung Chung line trains towards Hong Kong station and get just get off at next station - Lai King MTR station. Change trains to the MTR Tsuen Wan line towards Central station and get off at Prince Edward station. Again, change trains to the MTR Kwun Tong line towards Tiu Keng Leng and get off at Kowloon Tong station. Finally, change trains to the MTR East Rail towards Lo Wu station (HK$40.5, 62 minutes fastest approx). 2.) By Bus then MTR train - Route with the shortest travelling time (please note that you're NOT allowed to bring large luggage or items inside the bus. Take the Bus A43 or Bus N42A(overnight) from the Airport Bus Terminus at the Airport Passenger Terminal area going to Sheung Shui Railway Station bus stop (few meters away from the Sheung Shui MTR station (HK$29.2, about 40 minutes bus trip). Then take the MTR East Rail trains towards Lo Wu station - next station, (HK$20, 6 minutes). Note: All the train passengers will get off at Lo Wu (last station), take extra care of yourself as most of them are in hurry. You can find the HK immigration visitor's counter on the left most corner of the building. After leaving HK immigration, you need to walk few meters for the China (Shenzhen) immigration and right after China immigration (after the exit door) facing towards Shangrila Hotel, you can see a "Metro Train" staion with and escalator going down. Take that escalator to get you to the Taxi stand in the 1st underground level for your final destination (Bao-an district), Its about RMB80 to RMB100, 40 minutes). Hope this help and good luck in your trip. My business partner and I are flying into HKIA at 7:55pm and will need to get to Shenzhen Bao'an district that evening to stay in our hotel. I'm trying to get advice on the best way of transportation and how long this could potentially take?